The Black German Shepherd is not a distinctive breed. The most common German Shepherd colors are black and tan, but Black German Shepherds are black all over, with no markings. The gene for a black coat is recessive, meaning an all-black coat is quite rare. However, it can be achieved if both parents carry this gene. So, are there any differences between these dogs, and German Shepherds of any other color? And will the black coat color of your German Shepherd puppy have any bearing on their health and temperament? We’ll answer both these questions and many more. You can read our full review of the German Shepherd breed here. Black German Shepherds are sometimes mistaken as a totally different breed to the German Shepherd, due to their distinctive looks. But they are in fact, the same breed. As such, their history and origins are the same. It’s clear from the name, that the German Shepherd comes from Germany. Thanks to German Cavalry Officer Max von Stephanitz, they are one of the best-known dog breeds in both the US and worldwide. In the early 19th Century, Stephanitz made it his life’s work to develop the ideal herding dog. The result was none other than the German Shepherd. However, they’re now more well-known for their prowess as police dogs, service dogs, and excellent family pets. The black and tan coloration is certainly one of the most recognizable, along with the similar black and red German Shepherd. This last point refers to the breed standard, which favors strong rich colors. But if you have no desire to show your German Shepherd, it’s far better to select the newest member of your family based on their character, rather than the color of their fur. The genetics of coat color is complex, and the German Shepherd is no exception. Within this breed, genes for certain coat colors are dominant and others are recessive. Each puppy will inherit a pair of genes for encoding for coat color—one from the father and one from the mother. The gene for a black coat is recessive. This means that it’s relatively rare because it won’t be expressed if it occurs alongside the dominant gene for any other color. Instead, the dog will display the color of the dominant gene. How to Get a Black German Shepherd? The only way to guarantee a full litter of black puppies is to breed two black German Shepherd dogs together. This typically results in a solid black coat, although black and white German shepherd puppies are possible—usually a small fleck of white on the chest or paws. It’s also possible for puppies in litters that come from parent dogs with other colorations to be black. It all depends on the genes of each parent dog. If both German Shepherd parents carry the recessive gene for black coats, even though they may display the coat color of the dominant gene, some puppies may be all black. In outline, size, and coat type, the black German Shepherd is similar to a German Shepherd with any other color coat. German Shepherds are powerful, muscular dogs. On average, they stand somewhere between 22 to 26 inches tall and weigh 50 – 90 lbs. Some of their distinguishing features are pointed ears which give the impression of constant alertness. Another stand-out feature is a thick double coat. The only major difference is their striking jet-black coat. Some coat colors of German Shepherd take a while to develop as puppies grow into adulthood. So, the final color of your German Shepherd will not be certain until the outer layer of their double coat has grown in fully. However, all black German Shepherd puppies are usually born with a black coat and stay black as they grow up. With their thick double coats, all German Shepherd dogs require a significant amount of grooming. And the Black German Shepherd is no exception. Expect to brush your dog every few days. Most German Shepherds shed twice a year, and will likely need more extensive brushing during shedding season. While black long-haired German Shepherds are possible, they’re quite unusual. This is because both genes responsible for these qualities are recessive. That’s why you’re much less likely to see this combination than other combinations of coat color and length. German Shepherds are famed for their loyalty, energy, and intelligence. This breed enjoys taking on a guardian role in their family. As a result, they can be aloof with strangers. While they can enjoy interacting with people outside their families, bear in mind that if they feel their family is threatened, that they become aggressive. German Shepherds of all colors benefit greatly from puppy training. Attending classes can help you find the best training method for your dog. This will also help start the process of socializing with other dogs and people. For this breed, in particular, this is a vital stage of their training which should not be missed. Our training guide for the German Shepherd Dog has plenty of additional advice and tips on how to train this intelligent breed. Once you feel your black German Shepherd has a good base, you can start to enjoy a wide range of activities with your dog. There’s no denying that German Shepherds are energetic. You should be prepared for walking your dog at least once a day, if not more. Bored German Shepherds can easily become destructive. Don’t forget that owing to their intelligence, this breed thrives on mental stimulation as well as exercise. Keeping the mind and body of your German Shepherd active and engaged will help your dog feel their best. German Shepherds have been an incredibly popular breed for a long time. The breed ranks at number 2 in the American Kennel Club’s most popular breed rankings. No matter what color your German Shepherd is, they all share the same health concerns. Unfortunately, this breed is prone to a considerable number of health issues. If you’ve already located some Black German Shepherd breeders, it’s a good idea to speak to them about any potential health concerns. They should be more than willing to talk you through the health tests that they carry out and what the results mean for the health of their litters. You can read more about these conditions in our full breed review. If you’ve done any background reading about the German Shepherd already, you’ll probably be well aware that their spinal conformation has become the focus of a certain amount of scrutiny. While the traditional German Shepherd has a relatively level back, it’s far more likely to now see show dogs with an exaggerated slope towards the hind legs. Inherited defects like this can have adverse effects on the welfare of affected dogs. After all your research, if you decide that this color and breed are right for you, the next step is to find your new dog! 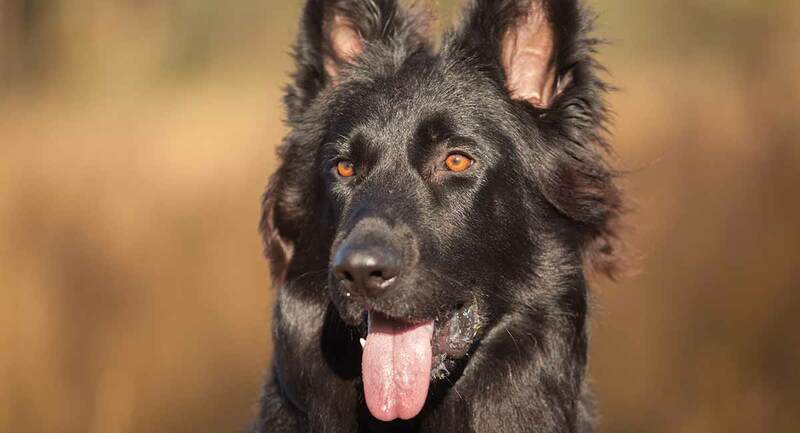 Luckily, there are plenty of reputable black German Shepherd breeders around the world. Some of them breed a range of colors, while others focus exclusively on black German Shepherds. Whichever breeder you choose, we suggest taking the time to visit their facilities. Ask to meet both parent dogs, and find out about any health testing the breeder has performed. After you meet different breeders and consider the health conditions that affect this breed, you may decide not to buy a puppy after all. Or you might decide to rehome an older black German Shepherd dog from a rescue organization. If you have a black German Shepherd, whether chose a puppy or rescued one through a charity, we’d love to hear from you in the comments below!